Figure 7.6. Velocity gained by leftover fuel mass in fission as a function of percentage a of mass fissioned. The three lower curves are multiplied by a factor 10 for clarity. Mpo is the rest mass of (added) iinert propellant. Are there ways to raise 7sp above that of fission NTR? The answer is yes, and it comes at a price. This alternative is to convert potential energy into electricity. This strategy involves an extra step, in which fission fragments heat a working fluid (not a propellant to be accelerated). Through a conventional thermodynamic cycle, this fluid may produce mechanical power and then electricity via a electric generator; MHD generators or other solutions are possible, each with its own efficiency [Bidault et al., 2004]. The electricity produced can feed an electric thruster like the ones of Sections 7.15 to 7.19. These thrusters are capable of much higher Isp than any NTR, because gas acceleration is not constrained by materials temperature, but driven by electrostatic or electromagnetic forces. The price of this strategy is the low efficiency of converting thermal into electric energy. The two main classes, or strategies, of nuclear propulsion systems consist of either converting fission energy into kinetic energy of a propellant, just as in any chemical rocket, or converting it into electricity powering an electric thruster. Past work in nuclear propulsion focused on the first strategy, because of the need to build large and heavy ICBMs (see the historical perspective in Section 7.5), and produced engines with substantial thrust and Isp close to 900 s. Nowadays, interest in interplanetary scientific missions, such as the Jupiter icy moons (JIMO) and Pluto missions, do focus on high-1sp nuclear electric propulsion (NEP), the second strategy. One of the reasons is certainly the Isp in the 3,500-4,000 s made possible with well-tested ion electric thrusters. At this point it is possible to draw some conclusions. Chemical propulsion is limited to Isp about 450 s. Its propellants consumption is too high for any practicable exploration of our Solar System. The only alternative, nuclear propulsion, has an energy density about 107 times larger: power demand may be satisfied, even though it grows with Isp3. Exploited in the simplest way as thermal energy, nuclear propulsion can double the Isp of chemical rockets, reaching Isp about 900 s using reasonable power solid-core reactors, historically the first nuclear propulsion systems ever developed (see Section 7.5). Accordingly, thrust can be significant, even in the tens or hundreds of kilonewtons. Thrust possible is closer to the thrust of chemical rockets, except that propellant consumption is exponentially lower. Alternatively, nuclear power can be converted into electric power. This strategy does carry a penalty, but also increases Isp by a factor >10: this in itself may enable interplanetary missions now unfeasible. The power demand is large at high Isp. However, even the power issue becomes more manageable with a nuclear energy source. At large energy density J, power depends chiefly on how fast a fluid can absorb it. This is an engineering, not a fundamental problem, and was successfully solved in the US and in the Soviet Union for the solid-core NTR developed at that time. The real issue with high-efficiency electric propulsion is not power but thrust: thrust is power divided by Isp, and tends to diminish as fast as Igp is raised: an ion engine with Isp of order 5,000 s and powered by 100 MW has a thrust of only 20 N or so. It may turn out that indeed nuclear electric propulsion for fast interplanetary missions must have power reactors in the gigawatt range: but this is not an outlandish requirement. The NTR tested at the time of the US NERVA program in the 1950s and 1960s could sustain power in the 1,000 MW range for more than 1 hour, and reached Isp of order 880 s. When NERVA was abruptly terminated in the 1970s, its technology was capable of a thrust/power ratio = 50 lbf/MW, and Isp close to 1,000 s. The PHOEBUS reactor produced more than 4 GW for more than 12 minutes [Dewar, 2004]. Its thrust, if a nozzle had been fitted, would have been of order 40 tons. No other energy source can match this performance even now. In summary, fundamental physics tells that the only non-chemical source of energy for space propulsion is nuclear. Nuclear fission has been tested since the 1950s. Fission can meet the two ideal requirements of lowering propellant consumption while still keeping thrust reasonable, that is, comparable to that of conventional rockets. 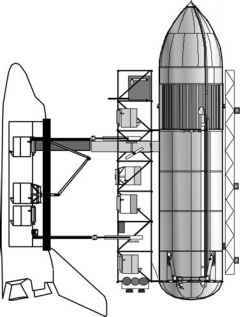 It is this multiple capability, independence from propellant, large Isp and large power in a compact package, that suggests nuclear propulsion as the only practicable means of reaching the planets of our Solar System; see also [Claybaugh et al., 2004]. Power is no bottleneck using nuclear propulsion. Rather, the debate is about the way of using it efficiently, that is, about specific utilization strategies. These are examined below.